Entering into retirement should be one of the happiest times of your life, you have the independence and freedom to do whatever you wish and many do not want to give up that independence. Staying put in your property can play a large part in helping you feel young and useful. Jim and Irene are both in their early 80s and have lived in their own home throughout retirement. Jim is relatively healthy but has suffered a mild stroke before, while Irene is still quite active she is starting to suffer from knee problems so is not as energetic as she used to be. “Living in our own home at the start of our retirement was not a problem, we were able to come and go as we pleased and for the first time in a long time we were able to carry out all the minor renovations we wanted to do.” says Jim. “One of the main concerns we had about living in our own home was what would happen if one of us was not home and the other had some sort of accident. Some friends of ours recommended that we install a community alarm, which can call for help if one of us were to have an accident. 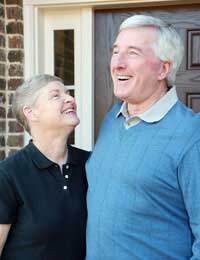 Our local authority supplied us with one after Jim had his stroke,” says Irene. “Living in your own home during retirement can sometimes be costly as the bills mount up. We fitted our house out with insulation, insulating the loft, pipes and walls, this not only kept the heat in but also helped cut down on bills,” says Irene. If you are over 60 it is possible to apply for grants to carry out maintenance work to the house and energy efficient measures. The Warm Front Scheme is one such grant but it is often means tested. “Being over 60 we discovered we were also entitled to the Winter Fuel Payment which is designed to assist with fuel costs. Once we had done this and made sure all of our windows and doors were insulted we found our bills went down automatically,” says Irene. Although you are less likely to get burgled in your old age you still need to make sure that your house is properly equipped. “We made sure we had good quality locks and bolts on all of our doors and installed safety chains in case anybody called at night and we weren’t sure who they were. We also invested in a burglar alarm to give us some extra confidence,” says Irene.You should also consider fire safety in your retirement, Irene and Jim made sure their smoke alarms worked and they were checking them regularly. “We also tried to avoid using our electric blanket and instead turned up the heating”, says Irene. Living in your own home is the preferred choice for people in their old age and retirement. There are a number of measures you can take before you even have to think about moving out of your own home, so contact your local authority and see what adjustments you can make to your own home.